"Streetwear has prioritized commerce over community". My love of fashion began when I discovered the work of Yohji Yamamoto. I thought to myself, wow, so this is what fashion can mean. My love of dress was however ignited by two things: (school) uniform and streetwear. I grew up surrounded and influenced by both, as I have spoken about before, both here on the blog and on my podcast. Growing up in what was then an impoverished area of London, primarily populated by ethnic minorities and immigrants, streetwear was literally the uniform of the streets. It provided an accessible alternative to mainstream dress codes, which was empowering in terms of the social recognition by peers that it could provide. If you wore the right trainers, it did not matter what you did or where you lived - you were the man. Yet surrounded by this, I spent the majority of my childhood and adolescence in school uniform, which is to say, a suit. I suppose my dressed identity since has been a sort of ongoing negotiation between these two ostensibly polar opposites. I still find it enjoyable trying to resolve both within my wardrobe without it fracturing, particularly as I like having as small and functional a wardrobe as possible. I actually still follow streetwear and sneaker news with closer regularity than I generally do high fashion, although given its proliferation that is perhaps to be expected. I believe that sneaker culture, and the sneaker market, being so strongly based on exclusivity and novelty, can be viewed as the epitome of the fashion system in action. Yuniya Kawamura actually wrote a book on sneakers as a subculture, which I heartily recommend. I actually hope I can write an academic book on sneakers one day to expand the field further...which, as it currently stands, is populated solely by that one book. She lays a vital groundwork, but I feel that her lack of insider experience does lead to some rather sweeping statements and erroneous conclusions. I like that though, because it fires me up. But I will save that for another time. Anyhow, I really have watched with interest as streetwear and sneaker culture has become a mainstream fashion trend. Admittedly they have both been pervasive in mainstream culture since the mid 1980s, but they have enjoyed a particularly fashionable Renaissance in the past few seasons. Fashion only really becomes readable in hindsight, but I think that streetwear will most certainly be viewed as having come on the heels of the death of #menswear and normcore. Only a cursory glance of hyped fashion on social media these days bombards the senses with Balenciaga Triple S's and "How much is your outfit worth?" posts. I find it utterly fascinating to see how streetwear has been stripped of its original values to the subculture, or if not fully stripped, then made palatable and accessible to a wider, more mainstream, audience. As much as I have been influenced by and partaken in streetwear, I have never personally felt that it was fully "my" culture. That is to say, that it was merely a part of the puzzle, rather than my sole focus. Thus I have not viewed this mass adoption of streetwear, and praise for who can spend the most, with anger as many others deeply embedded in the culture have. To be sure I get exasperated at the excess (unknowing fashionable excess being the sign of the fashion victim), but that is something that has always happened with whatever happens to be trendy at the given moment. 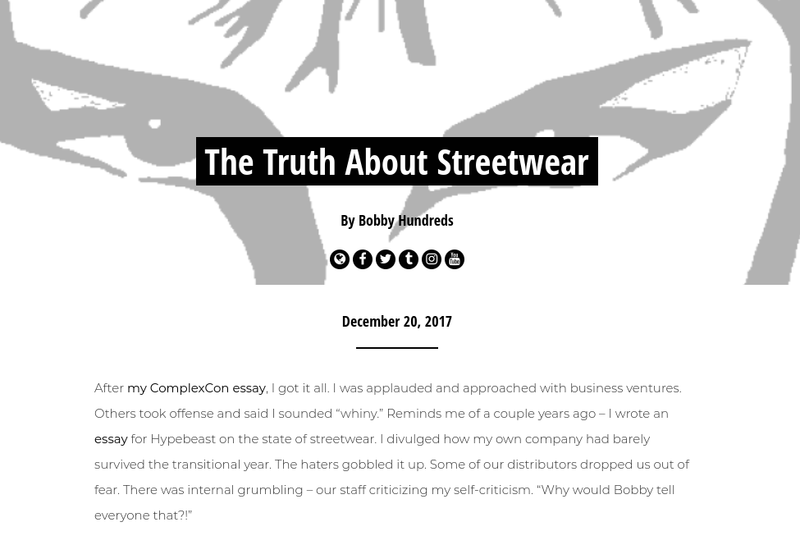 However, Bobby Hundreds (Bobby Kim) is a designer who is smack bang in the middle of the streetwear culture, and one of the major influences for the culture as it exists today. As such I was really engaged by his essay on the "truth" of streetwear as he sees it today. I found myself nodding along to a lot of his observations, and think that he really does describe a lot of issues concerning the culture today. I heartily recommend you click through and have a full read of his essay. I actually think that it is a fascinating example of what happens when a subculture is commodified and hyped to such a meteoric extreme (as streetwear has been over the past few seasons). The remark that really made me think was his observation that there is "less sense of culture now, only clothing and capital". I think that that is actually a necessity for a subculture to become part of mainstream fashion - it has to be stripped of those cultural values to allow for wearers to 'read' their own broader meanings into the clothing. These meanings are invariably removed from what those within the subculture subscribe to. The majority of fashion is a bricolage of elements from various cultures and subcultures (most often mined from the past). While some designers show a sensitivity and understanding of these sources, for the overwhelming majority of brands trying to maximise profits, their understanding is skin deep. That is to say, the reference it aesthetically, or at least, an approximation of it. Hundreds notes that high fashion will soon tire of streetwear, and I personally hope that this comes soon, because there is far too much lazy design at the moment. I think that it is easy for a designer to print random text and images haphazardly on sweats and call it streetwear. Or, as seems to be more popular for some reason, print their brand name repeatedly on tape and add a buckle to make a belt. All of these textual elements make the wearer seem to me like a computer image made real, where instead of hovering over pieces to find out more, it is already printed there for you to read. I also think that there is something interesting to be said there about the experience of the wearer in relation to wearing these textual elements, but I think that I might save that for a podcast episode. Overall I think that there is very little innovation, and without innovation, without novelty, fashion ceases to exist. His assertion that the objects of streetwear, that is to say the clothing, has been reduced down to simple transactions is one that I think that many of us recognise. You only have to see Instagram posts that show outfits with price tags written next to them, or YouTube videos celebrating the ever-increasing price of various outfits. It is as if to say that the best outfit is the most expensive outfit, which would seem to remove any sense of taste or style from the process of fashion. This has always frustrated me, and it is admittedly not solely a streetwear concern. It is actually something that I believe has grown concurrently with the use of social media, wherein our virtual selves have become an exaggerated caricature of our offline selves (albeit no less real for they simply reveal a part of us). But I am glad to see that he ends with a hope. That once the party moves on, many might stay and create something new and better. Fashion and dress for me has always been about communities, and so I think that the most exciting expressions result from the most vibrant and engaged of those communities. I do rather hope that streetwear returns to the underground, because while there are still so many exciting things going on under the radar, the conversation is better with less noise.